Social media can play a powerful role in communicating and engaging with parents, students, staff, and members of the community. Our students are “growing up digital,” with social media being an essential part of their lives. As FCPS employees, modeling appropriate behavior in the social space will help guide our students on the path to becoming good digital citizens. It will also help prevent any mishaps or misunderstandings that could affect us personally and/or professionally. Social media describes online technologies and platforms that enable individuals to share information, opinions, experiences, and perspectives with each other. Examples include Twitter, Facebook, Instagram, Pinterest, and YouTube. This document solely addresses social media use by staff in a non-instructional capacity, such as communicating with parents and other stakeholders about important news and updates, classroom activities, events, achievements, and other items of interest. Many of our employees already do an amazing job of using social media to showcase creativity, collaboration, and learning at its best. As a result, the excellence within #OurFCPS, in its pure, unfiltered form, becomes available for all to see. The values, professionalism, and confidentiality that employees are expected to embrace in their daily lives also apply online. Bring your best self to social media just as you do in your classroom or office. 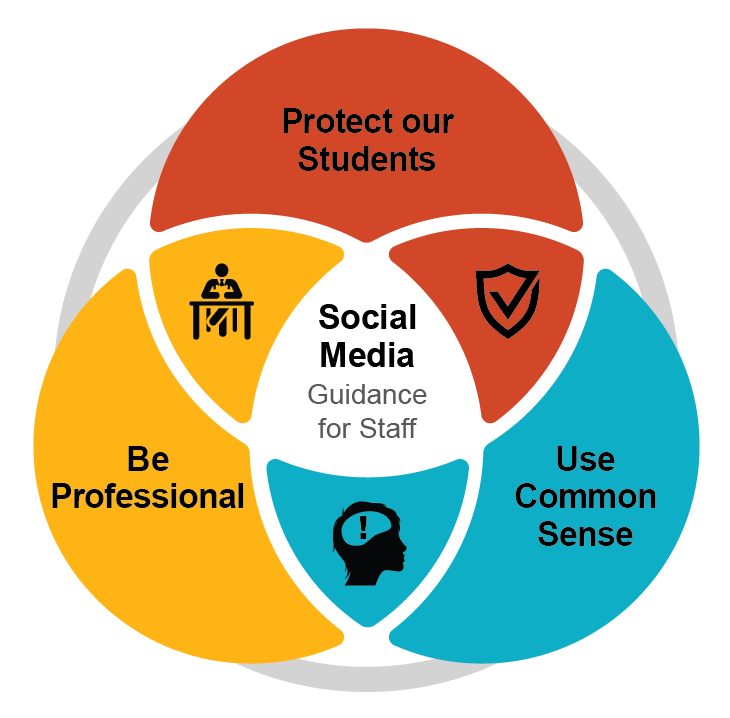 FCPS’ expectations for employee use of social media are based on the three principles below. Understanding these concepts will help empower you to make smart choices and feel confident about your online interactions. The safety and wellbeing of FCPS students is our primary concern. 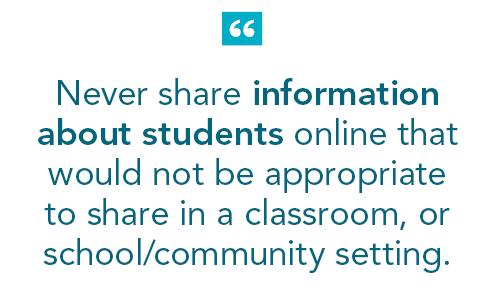 FCPS has the same obligation to protect student privacy online as it does offline. Federal law permits the disclosure of “directory information” from a student’s record without the parent’s prior written consent, unless the parent has opted out of such disclosure. Directory information includes, but is not limited to, the student’s name—we recommend using first names only—school name, photos, and awards. (It doesn’t hurt to let parents know that you plan to showcase your students on social media.) If a parent, or a student over age 18, has submitted a signed opt-out form noting Comprehensive Opt-Out Option or Choice C, you may not disclose the student’s directory information in social media without the parent’s written consent. See FCPS' Opt-Out Forms Packet for complete details. Also, please avoid inadvertently disclosing personal information about a student that would identify him or her as being enrolled in special education or other program that a parent may wish to keep private. There are numerous benefits to engaging in social media, but we all need to be aware of potential pitfalls. Maintaining professional boundaries is one way to avoid them. We recommend you avoid issuing or accepting requests from students or parents to friend or follow them. (They can follow you, if they choose.) Though it may seem harmless to retweet, like, favorite, tag, or engage with student posts in other ways, doing so can be misinterpreted as your having crossed professional boundaries. Establishing personal connections with parents may lead to the appearance of favoritism being shown to their student. In addition to your actions remaining professional, it’s best to keep your tone professional in social media as well. Stay positive. Don’t get caught up in negative or critical conversations, especially ones that involve students. If it’s an issue involving a stakeholder that needs to be addressed, politely offer to take the conversation offline. Consider reading your tweet aloud or have a colleague read it before you tweet. Whatever you do, be respectful—even if someone is not returning the favor. Lastly, personal social media account(s) should be kept separate from your professional account(s). And, do not post photos of FCPS students on your personal social media accounts. For better or worse, what you say or show on social platforms becomes part of your digital footprint. While your posts may intend no harm, the wrong one can put you in the center of controversy. 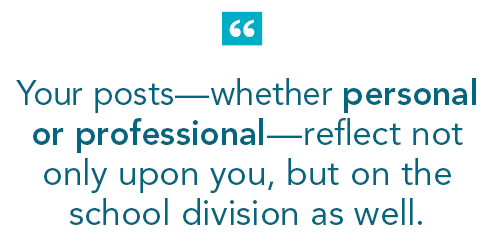 As an FCPS employee, your posts—whether personal or professional—reflect not only upon you, but also upon the school division. The content of your posts should not impair your capacity to maintain the respect of students and parents, or impair your ability to effectively perform your job. Any action that brings the school system into disrepute may be just cause for dismissal. (See Regulation 4293.6 Dismissal—Definition of Just Cause.) Making smart choices or using common sense is essential. Posting any content related to alcohol, tobacco, and/or illegal substances is not permitted on FCPS-related social media accounts unless it is for approved safety and wellness education purposes. Other content to avoid includes obscene, defamatory, discriminatory, harassing, violent, vulgar, or sexual material, or material that advocates the commission of a criminal act, violates FCPS policy or that reasonably may lead to the substantial disruption of or material interference with school system operations. Think twice before posting that type of content on your private social media accounts, too. They still reflect upon your role as an FCPS employee. For guidance around political posts, view these policies (intranet link). Please remember that the internet doesn’t forget. Your posts may be available to the world for years to come. Establishing appropriate privacy settings to limit access to personal information on your social media account(s) is a good idea. But, that’s no guarantee that the photo you send on your private Facebook account won’t end up being shared by one of your friends. Before posting, ask yourself if you would want your significant other, grandparent, or the superintendent to see it. If not, don’t post it. Following this advice can prevent problems for you and for FCPS. Finally, be transparent. Only a few people within FCPS are charged with speaking on behalf of the school district. Please don’t make statements on social media that could be construed as you representing FCPS in an official capacity. This document is meant to provide general guidance and does not cover every potential social media situation. Employees will be held responsible for the disclosure, whether purposeful or inadvertent, of confidential or private information, information that violates the privacy rights or other rights of a third party, or the content of anything they post on any social media platform. This guidance is intended to supplement, not supersede, existing law, and FCPS policies and regulations. All existing laws, and FCPS policies and regulations that cover employee conduct may be applicable in the social media environment. Supervisors should consult with Human Resources and/or Division Counsel before taking employment action on the basis of personal speech. Questions? Please contact the Office of Communication and Community Relations at ccrsocial@fcps.edu or 571-423-1200. Find simple tactical tips to help maximize your social media efforts.